Spotify has revealed its fiscal performance for the first three months of 2018 – with Q1 revenues hitting €1.14bn ($1.4bn) and operating losses in the period standing at €41m ($50.4m). The company’s sales were up 26% on the first quarter of 2017, and up 37% after adjusting for the negative impact from changes in foreign exchange rates. Spotify revealed the figures today (May 2) as a public company, after floating on the New York Stock Exchange last month. It told shareholders that, as of the end of March 2018, its paying subscriber base worldwide stood at 75m. 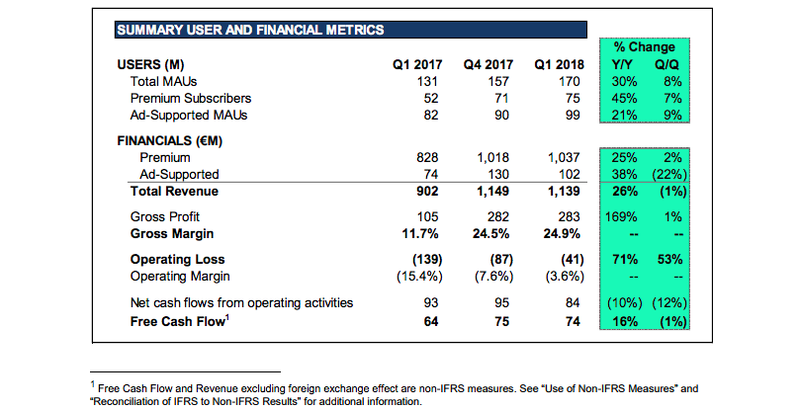 That’s 4m up on the 71m subscribers that the company counted at the end of (December) 2017, and up 45% year-on-year. That’s an addition of around 1.3m subscribers per month in Jan-March this year. The platform finished Q1 with 170m total Monthly Active Users (MAU), up 30% year-on-year. 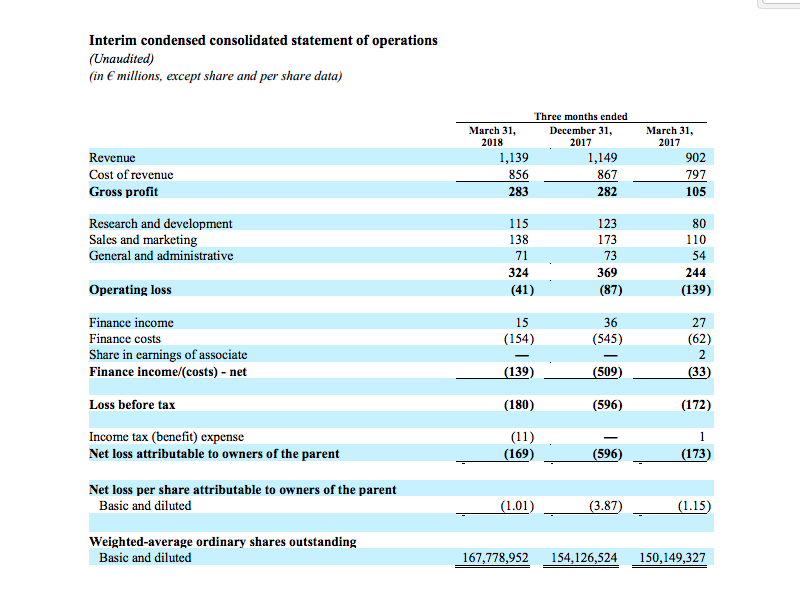 Gross margin was 24.9% in Q1, above the high end of Spotify’s guidance range of 23-24%. The operating losses of €41 million represented approximately 4% of total revenue. Spotify’s ad-supported MAUs totalled 99 million at the end of Q1, up 21% Y/Y and 9% Q/Q. Spotify’s Premium subscription revenue was €1.04bn in Q1, up 25% Y/Y. Foreign exchange rates had a meaningful impact as Premium revenue would have been up 36% Y/Y if the negative impact were excluded. Ad-Supported revenue was €102 million in Q1, up 38% Y/Y. Foreign exchange rates also had a substantial impact on advertising revenues due to the mix of US dollar denominated revenue. Adjusting for the impact of foreign exchange rates, Ad-Supported revenue would have grown 55% Y/Y.